It’s a big decision. Talk about it. That’s the bottom line message of the most recent United States Military marketing campaign, which is titled “Conversations”. 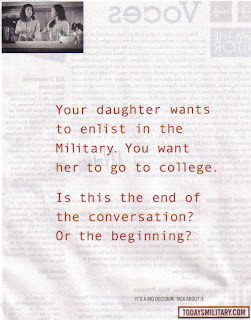 Similar advertising is found on television and on the web, depicting parents having discussions about military service with their recruitment-age children. Officials with the Department of Defense’s Joint Advertising, Market Research and Studies program believe the marketing campaign accurately reflects conversations that are taking place in homes across America. 1. The consideration of joining the military is a source of conflict. 2. Parents are important decision makers in their children’s consideration of joining the military. 3. Parents don’t know all the facts about military service. 4. If parents and children have a frank and honest discussion about military service based on facts, then everybody has won, regardless of the final decision. In Part 2 of this post, I will examine these presumptions and tell you how you can apply the themes of the military’s marketing campaign to conflict management in your own life.